There are several types of canine bladder problems. A general overview of each problem is provided below with links to pages which focus on each condition including bladder symptoms, diagnosis and treatment. You will also find highlight of recent medical studies, natural medicine and home remedies when available. Dog bladder problems can be prevented with some of our tips listed at the bottom of the page. 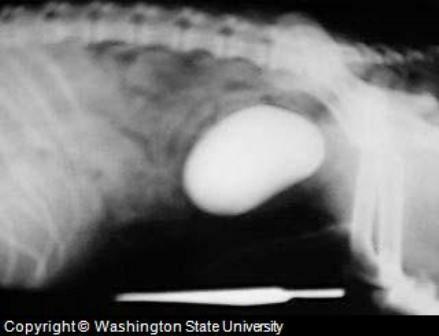 Canine bladder cancer is difficult to diagnose since the symptoms can look as if your dog as a urinary tract infection. Tumor growth in the bladder can grow to cause blockages, resulting in irregular urination. Since urine is the way the body cleanses itself of infection and prevents crystals from turning into bladder stones, these problems could develop as well. Symptoms associated with dog bladder cancer in addition to problems urinating, include the presence of blood in the urine and possibly a problem with the respiratory system (trouble breathing). Treatment options for bladder cancer include anti-inflammatory medications (proxicam), surgery, chemotherapy and radiation. The prognosis depends on if the cancer has spread and if the tumor (s) can easily be removed with surgery. Recent studies have shown some success in reducing the tumors with medications. Loss of canine bladder control, or canine bladder leaking can be due to several problems in the urinary system. The most likely causes are infection, the formation of stones, some type of structural problem that needs to be corrected or due to a behavioral issue such as stress. As indicated above, if there is a problem with the urinary system such as infection, inflammation sets in along the urinary tract. The inflammation constricts the various tubes that carry urine, which blocks the normal flow. Other problems such as the PH not being right, reduces the effectiveness of the urine to naturally fight infection. Treatment for dog bladder control include removing the underlying cause such as the use of antibiotics for infection, or other treatment to dissolve or remove the stones. Surgery may be needed to remove stones or correct a part of the system that isn't formed correctly. In female spayed dogs, approximately 10% of dog bladder problems occur within 1 year of being spayed. The condition called USMI (urethral sphincter mechanism incontinence) occurs when the muscles do not completely stop urine from flowing through the urethra. Conventional treatment has a high success rate using estrogen therapy or new drugs which just came to market. These have some potential side effects such as diarrhea, vomiting and in the case of estrogen, increased attraction of male dogs. Your dog's bladder can become enlarged due to many of the problems described above. The growth of cancerous tumors, or inflammation from fungal or bacterial infection can lead to inflammation or even a thickened bladder wall. Symptoms are similar to other dog bladder problems including problems urinating, blood in the urine and the appearance that your dog is in pain when urinating. The urethra is the part of the dog that carries urine to the outside of the body. Bacteria can also travel up this tube into the urinary system and find its way to the bladder. Infection can take hold when there is some type of immune system deficiency or problem with the urine or urinary tract. Dog bladder infection occurs when the bacteria takes hold in the lower urinary tract and then finds its way into the bladder. The infection causes the entire system to become inflamed resulting in painful, unusual or reduced levels of urination. When your dog does urinate you may notice that the force of the urine is not as strong as usual. Bacteria may have entered your dog in the first place due to poor cleanliness, the lack of fresh drinking water, your dog isn't drinking enough or the urine doesn't have the correct PH to kill off the bacteria. If is imperative that you take your dog to the veterinarian for treatment. Antibiotics will effectively kill off the bacteria. Treatment can last for days to as long as 6 months for canine chronic bladder infections. Natural remedies could help to correct the PH of the urine such as PetAlive UTI-Free Formula for Pet Urinary Tract Infections. Switching to canned dog food can also help to provide more moisture since canned has 80% more water than dry kibble. Canine bladder stones are formed when crystals in the urine are able to cling together forming stones. There are primarily two types of stones, struvite and oxalate. The best treatment option is to try and flush the stones from the body. Dietary change to a commercial food such as Hill's Prescription Diet s/d has been shown to dissolve struvite stones or Hill's Prescription Diet u/d for longer term management of dogs that get stones, may be called for. Oxalate stones cannot be dissolved with diet and often requires surgical removal. As mentioned, there are several steps you can take to either prevent canine bladder problems from occurring in the first place or reoccurring. The key is to help the body do its job. Diet: Consider changing your dog's food to one make to support urinary health such as the two Hill's products mentioned above. A switch to canned dog food may be of help. Water: Drinking more will result in more frequent urination which will naturally clean your dog's urinary tract. Natural Remedies: Many herbs such as Arctostaphylos uva ursi or Berberis vulgaris are popular remedies to improve the PH of urine and soothe the urinary system. UTI Free is made specifically for this purpose and is a good source of additional information on avoiding dog bladder problems.